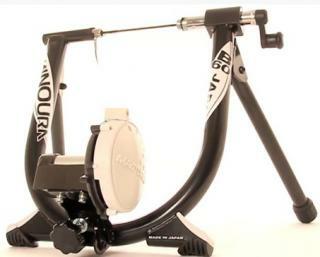 The Minoura B60-R is a direct upgrade to the B60-D. As one of Minoura’s entry-level turbo trainers it is relatively basic in what it does, however it is still a good trainer that uses Minoura’s Magturbo braking system, which was the first and original magnetic resistance braking unit ever used on turbo trainers. 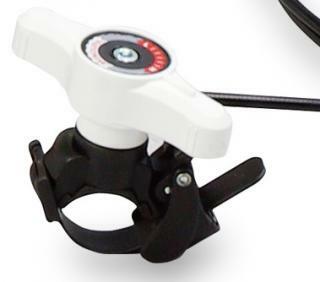 The B60-R uses a handlebar mountable resistance lever that allows you to select up to 7 different resistance levels as you cycle (this is what makes it different to the B60-D). 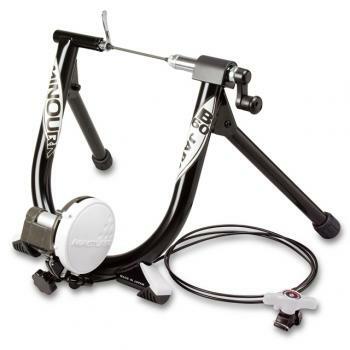 Like its sister trainer the B60-D, this turbo trainer generates 425 Watts of power when you get up to 40km/h in speed, or 662 Watts of power if you reach 60 km/h. The Minoura B60-R uses a ferrite magnetic and a 0.6 kg dual steel flywheel to generate its resistance and inertial forces as you workout. The frame is lightweight but solid, weighing around 5.5 kg and comes with a 5 year manufacturer’s warranty. The trainer comes with a special Q/R skewer to replace your bikes normal skewer that allows it to fix on the frame easily and securely. The braking unit itself comes with a 1 year warranty.